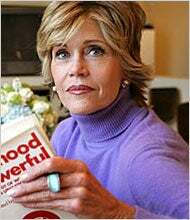 Having mixed feelings about A) Jane Fonda and B) celebrity blogging generally, we were prepared to be skeptical about the actress's recent foray into cyberspace. But guess what? It's a pretty good read! Fonda's blog has an important thing going for it: as opposed to a Gwyneth-like exposition on her life or a Sean Penn-esque philosophical dissertation, this blog has a purpose. It's Fonda's chronicle of the lead-up to her new Broadway play, 33 Variations. Fonda takes us through the rehearsal process and the anxieties of returning to the stage after a long absence and, in short, gives us access to a world we wouldn't otherwise see and a subject that's of real interest to people. As to the writing itself, it's quite engaging. Yes, it can veer into self-seriousness and empowerment-speak (no shocker to anyone who, um, read her recent memoir My Life So Far) but overall, Fonda comes across as appealingly open without veering into the brand of late-night overshare that's another celeb favorite. And she drops just enough names to keep us comfortably star-struck! Made a positive discovery during the dinner break. I was able to fall asleep with Tulea on the couch in my little antechamber. I wasn't sure I'd be able to cause its real tiny, but when the lights were all off and my ear plugs were in—swish. I was out. It's a kind of Pavlovian thing that started in 1989 when I did the film "Stanley and Iris" with Robert DeNiro. I was fifty or so back then and finding that I needed a nap during the lunch break. I had never been a napper but I found that ear plugs made all the difference—signals to tune out. Even if I was only really asleep for 10 minutes, it made a real difference. My napping skills got honed during the decade with Ted who is a daily napper, then I got out of the habit because if your life isn't arranged so that regular napping is possible, you find you get wiped around nap time but have to push through. Now, with this play, I can tell that napping will be de rigueur again...I'm thinking all this isn't very interesting so I will stop for today. Tripping out about naps must be a sign. See? Kind of endearing! There's an inherent arrogance, perhaps, to keeping such a journal and presuming anyone's interested, and it's certainly true that none of her stage nerves or anxiety's going to inspire much sympathy from anyone who's really hurting in the current economic climate. But overall? I was pleasantly surprised. I'm not saying the Jane Fonda going on the daily blogroll any time soon, but I should think it's a boon for real theatre-lovers. And it's actually a good idea: while I'm guessing not many films would stand for it, how fun would it be to be able to follow the production of more movies or shows? Anyway, Jane, welcome to the Blogosphere. And if you want to know what to avoid, may we draw your attention to a little newsletter called Goop?